This very rich star field is located just south of a line joining the star ι Aurigae and θ Aurigae. 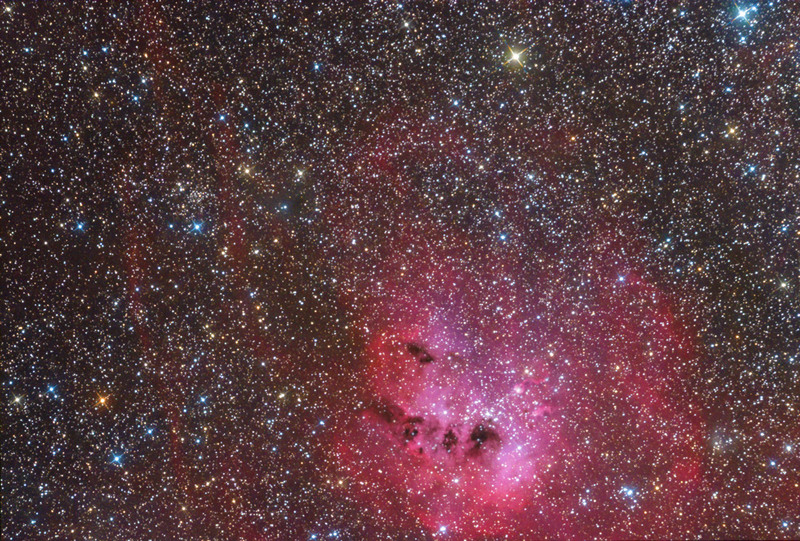 At the bottom is IC 410 with its prominent "Tadepoles". It is a large emission nebula and home to major star-forming processes generating massive stars. The nebula is linked to the open cluster NGC 1893 formed by young, rather dispersed massive stars. Estimates of its distance, however, are very uncertain. Studies based on the determination of CO emissions have provided a distance value around 3200 parsecs (10,400 light years), while others photometric studies have made a distance of 4800 parsecs (15,650 light years). There are a few other objects on the image (see the mouseover). Among them is VdB 39 - faint, moderately blue reflection nebula, illuminated by the star BD +32 970. A narrowband images of IC 410 can be found here and here.